3 wheel scooters are becoming more and more popular with older children for many reasons. Some children prefer the stability of being on 3 wheels. Other children may have dyspraxia or other conditions which means they prefer using 3 wheels. The good news is there are many options of 3 wheel scooters for the older age group. The scooters below are 3 wheel scooters designed for older children from around aged 5 or 6 to 12 years old. ✔️ Top Tip - When choosing a scooter the handlebar should be adjustable so that it is around hip to waist height on the rider. A handlebar which is too low or a too high makes the scooter very difficult to control. This scooter is expensive but you get a durable scooter which is designed to last. They have a good resale value on sites like ebay too. The scooter has modular parts which are all replaceable so it should in theory last forever. It definitely can be passed onto siblings. It's aimed for kids aged 5 to 12 but younger and older kids have used this scooter too (some as young as 4, some as old as 12). In reality, it's best to ignore the recommended age and go for look for the height of the handlebar. The lowest handlebar setting is 67cm. Ideally you want the handlebar to come up to waist height on a child, and the lowest height setting of 67cm will be fine small children. The heightest handlebar setting is 93cm which will be fine for many 12 year olds as long as they are under the max weight of 50kg for this scooter. It features a height adjustable handlebar with height ranges from 67cm to 93cm. The handlebar has a quick release clamp so you can easily set it at any point in this height range. This means it will be the perfect height for your child when they are using it and as they grow. The wheels are 120mm wheels at the front and a 80mm wheel at the back. They are made of high quality PU and offer a really smooth, quick ride along the pavements. It doesn't fold but you can take the handlebar out of the base for storage or for travel. ​It features a lean to steer mechanism, so you lean to turn left or right. This is great for "surfing the sidewalks". It's slightly heavier than the mini micro but still super lightweight at just 5.5 pounds or 2.5kg. The weight limit on the maxi micro is 50kg. It's on the more expensive side but you a really paying for the high quality parts which are durable, strong and will last. It can be passed onto siblings and you may never need to buy another kick scooter. It offers a very quiet and smooth ride, there won't be any rattling parts on a maxi micro scooter. 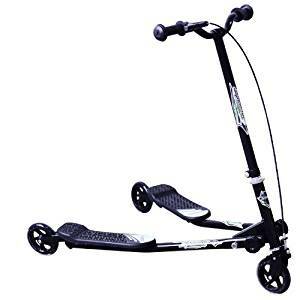 Best for - This is a great scooter for all age ranges. It's low handlebar setting will accomodate younger, smaller children and the highest handlebar height many tall children. It is lightweight and built to last so very difficult to go wrong. You won't need to buy another 3 wheel scooter for your child. Not Ideal for - those on a tight budget or those looking for a foldable scooter. ✔️ Top Tip - Lightweight scooters can be advantageous. They are easy to carry and easy for younger, smaller children to control. For example, it's easier for them to lift up and down steps and kerbs. There is no a deluxe version of the maxi micro that has all the features of the classic version (as above) but a few more too. The first change is that it's foldable. This makes it easier to carry and store. You can now fit it into a boot, under the stairs, or in a school locker. The handlebar is made out of anodised aluminium which means that it's less likely to corrode. The classic's handlebar is made of aluminium. ✔️ Top Tip - Folding scooters can be more convenient and make the scooter easy to store and carry. However, a folding mechanism will add weight to the scooter so even though it can be folded it may make it heavier to carry. This iscoot pro v2 is another a great alternative to the mini micro scooter, especially if you are on a budget. The Iscoot is another 3 wheel scooter designed for kids aged 3 and older. I actually bought this for a friend's son who was age 6 at the time and wouldn't go on 2 wheel scooters. The reports back were that he loved it and used it a lot. The scooter has a folding mechanism that is great for storing, carrying and transporting a scooter in the car. ​ It has a height adjustable handlebar so will grow with your child. The handlebar adjusts from 69cm to 84cm. The wheel size is 120mm. This makes the scooter great for cruising as larger wheels tend to go over cracks and bumps in the pavement more easily giving a smoother and faster ride. The wheels are made of PU material and they have ABEC 5 bearings. The scooter weighs approximately 4kg so is quite a bit heavier than the maxi micro and iscoot blaze. On paper, this scooter looks good and it does have some very good reviews on amazon. However, the reviews aren't as consistently good as for the micro maxi but it's over half the price cheaper. The maxi micro scooter is also more lightweight which can make it easier to control and go a bit more quickly too. Best For: Younger or smaller children who need a handlebar on a low height setting. Not Ideal for - those who are looking for a lightweight scooter that's easy to carry. At 4kg it's the heaviest scooter featured. Also tall children will want a scooter with a higher handlebar setting. ✔️ Top Tip - 120mm are slightly bigger than standard sized wheels on two wheel scooters but bigger wheels will give a smoother ride over bumps and cracks in the pavement. This scooter is designed for kids aged 3 to 12 so it's designed for older kids. It has five different height settings at 62cm, 75cm, 80cm, 85cm and 90cm. So there should be a height to suit most older kids. The scooter features 120mm front wheels and a rear 100mm wheel Bigger wheels mean less kicks to get you speed up. The big wheels also mean a very stable ride. The wheels are PU so offer a smooth ride too. The age recommendation for 3 style scooter is recommended for the age of 5 to 10 years old. However, the lowest handlebar setting is 58cm so much younger kids should have no problem using this scooter. The handlebar is adjustable from 58cm to 85cm. However, there are only two adjustable height settings in this range, whereas with a scooter like the maxi micro you can adjust it to any point within the height range stated. The scooter weight approximately 3.23kg. Best for - best for young and small children as they lowest handlebar height is 58cm. Not Ideal For - not ideal for people who want a scooter which can be height adjusted to any height. The Max Street Board is recommended for children aged 6 plus to adult with a weight limit of 100kg. The handlebar is height adjustable from 70cm to 97cm so this handlebar has the highest setting featured on this page and is a good choice for taller children. The handlebar is foldable so it's easy to store. One thing to notice with the max board scooter is that it weighs 5.5kg so if you're looking for a scooter you might have to carry a light it is probably worth going with a lighter scooter. Another option of 3 wheel scooter for older children are tri scooters, also known as flickr or caster scooters. The Homcom works by sliding your feet, twisting your hips and moving from side to side propel the scooter forwards. The scooter allows the rider to propel forward without ever having to pedal or touch the ground, a low-impact exercise. It's ideal for use on smooth flat surfaces. It's great for building strength on legs, body coordination and balance.